Everything. The facility was lovely with fresh flowers in the cottage and whatever you needed was provided (sunscreen, aloe, insect repellent, beach towels, coffee, small appliances). Also available were bicycles, kayaks, lawn chairs, coolers, grills. A relaxing, cozy atmosphere. Everything was super easy during my stay at the Fern grotto. Paul was a very reliable host and very helpful. I would recommend this place to anyone! Wish I stayed my entire trip here. Looking forward to coming back! Perfect location for exploring. Beach chairs, umbrellas, coolers, kayaks and snorkel gear provided for free use. Kayaks and bikes made this place feel like an adventure every day. Wanted to stay forever biking to snorkel the sea, kayaking to secluded waterfalls. Amazing! Perfect location. 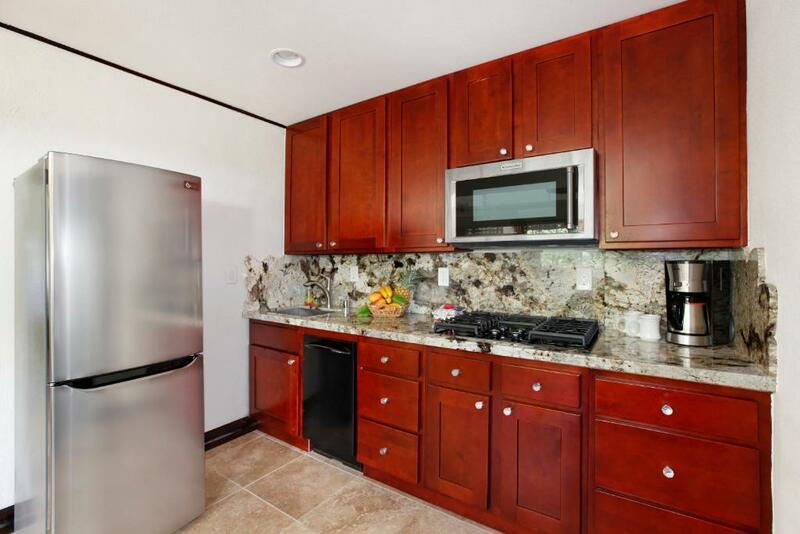 Walking distance to the beach and parks. Love that we had access to coolers, chairs, washer & dryer. Loved everything! Ohana House provided a comfortable spot to enjoy the lush gardens whether you were walking the grounds or relaxing on the front veranda. Paul provides everything you need for an active holiday: beach equipment, bathing shoes, sunscreen, mask, kayak, bicycles, washing machine - Optimal !, Furthermore, the kitchen is well equipped. Coffee and sugar for the first breakfast already exists. I was also happy about the chocolate in the fridge and the beautiful bouquet of flowers. 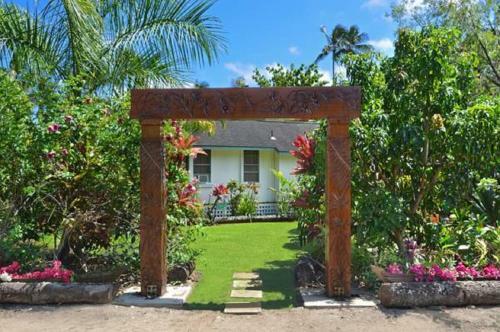 The cottage is located perfect near to the local beaches and in the middle between the beaches and hiking areas on the north shore and south shore of the Island Kauai. I really can recommend this accommodation ! Lush gardens and a warm welcoming even though we came late. LOVED the provisions of bikes, kayaks, nice beach gear, etc. Loved the welcome beers, even though we took one sip and realized they were IPAs (which we both hate), but really enjoyed the chocolates. LOVED a "HOME", and some real privacy. Kitchen was very well stocked, I really appreciated that. Picking fresh fruits from the yard and having them for breakfast was a bonus, and the variety of exotic birds on property was amazing. The fans kept bugs away and also kept us cool in the yard while chilling and reading books in the afternoon sun. An easy bike ride to the beach for a picnic at sunset made the perfect day. The location is central and easy to get to. The place is quaint, homey and like Hawaiian homestead in the 50’s. Lots of fruit trees in the facility. The host/owner is very attentive and welcoming, he put in a lot of efforts in attention to details, little things that matter, which makes the stay so much better and comfortable, is a home away from home! Lock in a great price for Fern Grotto Inn – rated 9.1 by recent guests! Fern Grotto Inn This rating is a reflection of how the property compares to the industry standard when it comes to price, facilities and services available. It's based on a self-evaluation by the property. Use this rating to help choose your stay! One of our top picks in Kapaa.Located in Kapaa town, Fern Grotto Inn offers authentic old-style plantation cottages with island-inspired furnishings and modern amenities. Guests can relax in the private garden. This inn is less than 5 minutes’ walk to the beach and Wailua Golf Course. Offering free WiFi, the spacious guest cottages at Fern Grotto Inn feature a cable TV. Guests have access to a BBQ area. Guests can spend a lazy afternoon paddling down the Wailua River in a complimentary 2-person Kayak, or take a bicycle ride to nearby Lydgate Beach. Fern Grotto Inn is 5 minutes’ walk from Waipouli Town Center. Opaeka’s Falls and Lydgate State Park are both 3 minutes’ drive away. When would you like to stay at Fern Grotto Inn? This spacious cottage, known as the River Cottage, offers antique furnishings, 50 year old refinished hardwood floors, air-conditioning, a tile shower and features a spacious open-design with a queen-size bed. This spacious cottage, known as the Garden Cottage includes air-conditioning, hardwood floors, a tile shower for 2 and contemporary tropical decor. It offers vaulted ceilings and plentiful windows that lend a sense of warmth and spaciousness. 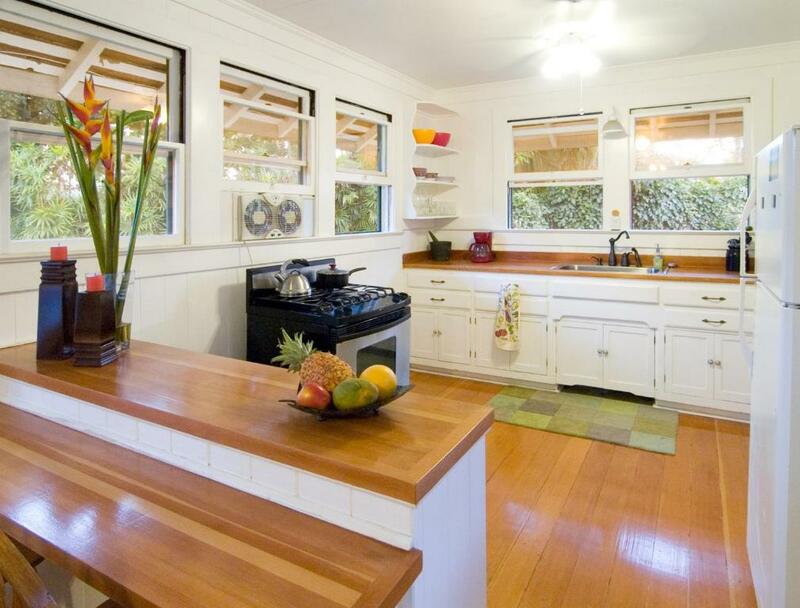 Boasting a fully equipped kitchenette, this cottage, known as Canal Cottage A, offers river views. It features a spacious, open-design with a queen-size bed, tropical wood accents and a ceiling fan. There is also a small patio area in the garden just outside the front door. 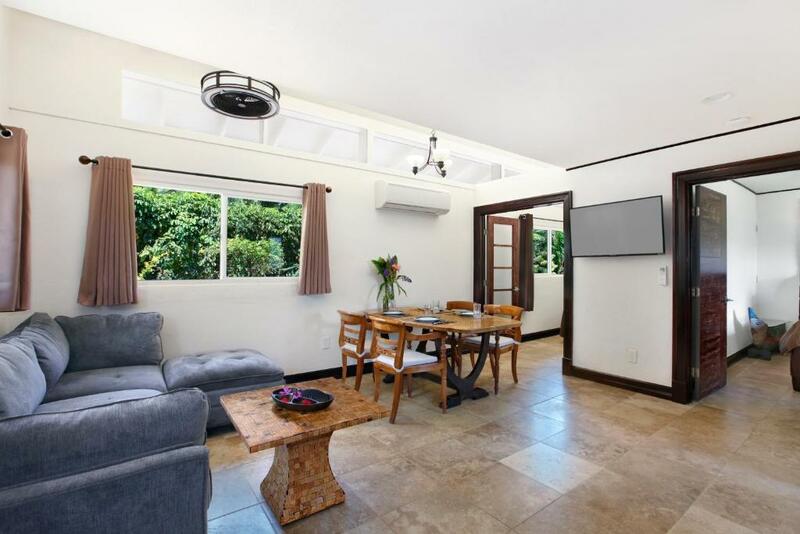 This cottage, known as Canal Cottage B, features bamboo accents, sustainable wood floors, vaulted ceilings, a tiled shower, and a fully equipped kitchenette A private balcony is just outside the front door overlooking tropical gardens. Our Kauai cottages rentals are located in Kapaa town, on the east side of the island. We’re five miles from the airport, one block from the beach, and only a few minutes from grocery stores, restaurants, and shops. House Rules Fern Grotto Inn takes special requests – add in the next step! Fern Grotto Inn accepts these cards and reserves the right to temporarily hold an amount prior to arrival. Payment is due at time of booking via bank transfer or credit card. Credit card fee is 3% for Domestic guests and 4% for International guests. Please note: The credit card fee is always Non-Refundable, regardless of the policy. Please inform Fern Grotto Inn of your expected arrival time in advance. You can use the Special Requests box when booking, or contact the property directly using the contact details in your confirmation. Everything was great. Can't complain. The bed is way too soft and small for a good night sleep. 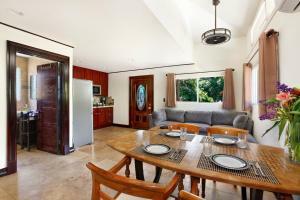 Nice cottage with a beautiful view over Wailua River. The owner makes sure you feel at home and has thought of all small details. Parking. More spaces needed or assigned spots. The room was set up spectacularly and Paul was amazing. Our room, Canal B, needs AC. The added activity items was a great plus. Plus the free laundry room was a bonus! There are no restaurants/bars within walking distance. The bathroom is separated from the rest of the cottage simply by a wall - there's no separate ceiling! Large, well-designed, charming interieur. Well equipped Inside as well as outside (bicycles, kayaks, beach equipment, etc). Our house was close to the road, which wasn't a big deal, as its nice to move around the grounds and enjoy different spaces as the sun changes. Later at night the road isn't as busy, but, its still close to the road - perhaps more fountains would help dampen the sound? The common area was well appointed for function, but could be better. The raised bed could easily have a hot tub, fire pit, and or tiki bar (honor style) with epic views of the river. Id happily pay $50/night more for access to amenities like that. :) Just putting it out there - hopefully its in place when we come again!